Hand Readings of famous people: Angelina Jolie's hand shows that she is fun to be with though she isn't serious enough! Angelina Jolie's hand shows that she is fun to be with though she isn't serious enough! Angelina, the famous Hollywood actress, can be a little too casual about life and can lose focus. It’s almost as if an important cog in the serious business of life and living, needs a little tightening. This gives her personality an undesirable tilt and lack of balance. But she has other personality characteristics which have earned her fame and name. She has a certain force to her personality, she is a go-getter. Ambitious and dominating, she is an independent thinker who likes to follow through with action. 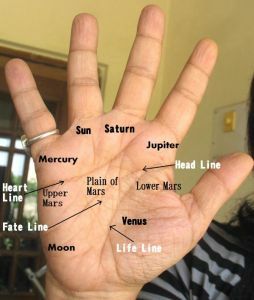 She has strong fingers of Jupiter (index) and Apollo (ring), although the Saturn (middle) finger is a little wanting. Her lines seem to be nothing exceptional although she has a good thumb with a conic tip and a waisted second phalange. The mounts on her hand are not very well developed, except perhaps the Moon mount, relatively speaking. It is disappointing to see the limited Venus mount. The fingers are of a good length, with good knots and very good second phalanges, and the palm is rectangular, more long than broad. She very possibly has a Girdle of Venus and the third phalanges are long. No doubt she has ambition and determination. She may not possess oodles of acting talent, but she does have an original way of approaching her work. When she decides on something she acts on it and follows it through. However, her determination can have a downside. Angelina tends to do what her mind and heart tell her to do, without thinking too much about what others or society think, and what the consequences are. She is a thinker, but there is a certain boldness to her personality and fear of restrictions and disregard for societal norms. Besides, although she is emotionally sensitive, can be hyper emotionally, and has a good heart, she is not volatile emotionally. This means she does not have the kind of ups and downs in her emotional life. She is not the one to let her steam off and come back to normal. She is more likely to nurture hurts and tolerate. When it comes to the crunch, she can take hard decisions. Check out a hand photo of hers here and here. She is left-handed and it is her left hand which has been studied to get an idea of her current self. The image above is a free image by OpenClipart-Vectors from Pixabay. She has a sense of disciplined and also a great diplomacy. She can accomplish her desires without being distracted by pandering to sensual and physical pleasures, be it eating, drinking or anything else. She can rough it out and put her body through a lot of strain. And she can get around people. She is shrewd and smart, with good powers of expression, persuasive and very tactful, with an almost uncanny ability to get her way. Add to this an ability to plan in advance and her analytical thinking and you have a list of formidable qualities! She is not careless when it comes to planning her projects. She has good reasoning powers as well. There is a strong sense of adventure in her personality, although hers is more of a thoughtful person. She has the ability to have fun, let go, and would be ready for something new. Such people are usually very sporting and understanding. In her personal life, she is likely to be quite dominating, more so as she likes to do what she pleases. But she is basically a happy person and not as tough as she appears. She can buckle under pressure and can be surprisingly flexible. She is not that strong a person from the inside and can feel discouraged. In fact, in her heart of hearts, this woman is very vulnerable and not at all as mentally strong as she appears. She is the kind who needs emotional support and she probably knows this. She is the kind of person who can compromise quite a bit in a relationship for the sake of someone she loves. She needs a beacon to stabilize her, push her in the right direction when she starts to shift focus. If she does not find the stability that she is looking for, it can affect her relationships. However, if she feels hemmed in, the relationship is in trouble. Angelina desires and wants love and devotion, not money, and nor is she a status-seeking person. In fact, she is not at all materialistic but this quality can at times go to an extreme because she can become careless of the future and spend too much. Jolie has a sharp mind and can be a mentally stimulating companion although she has a tendency to gossip, although privately. The shape of her hand tells us that Angelina has a tendency to see things from her own viewpoint without seeing the overall impact of her actions. She is also fiercely independent. If one has to write a conclusion to this character sketch one can say that though Angelina tends to go overboard at times, and can be arrogant and egoistic and careless, she can bend. Kanagu, thanks. Yes it is possible to read the hands of great leaders. In fact I have the hand print of the late Radhakrishnan, who was an intellectual as my father (from whom I have learnt a lot of my palmistry) actually met. One of these days I will do an analysis of our late leaders, like Indira Gandhi and so on. The only thing one requires are hand prints or photos. It might be difficult to get those of some leaders. And its always fun to get one's hand read! However much one thinks one knows oneself, the truth is that we always tend to gloss over our faults, or at least downplay them! And seeing us the way we are helps us a lot in our future, because character is destiny. Interesting post. I had watched an interview on tv where she had mentioned that she used to cut herself when she was a teen. I wonder if it's possible to check this against her hand? purpler, as she is well into her thirties now, this could show a trait in her character in her teens, which would probably be an inherited quality. What her inherited quality shows is a seriousness and intenseness which is not present now. But overall, it is difficult to read a hand in much detail without seeing the lines properly. In fact it is a challenge most times! I am discovering such a nice blog! The Blog header is too good... so many palms! Hullo Marina. Angelina Jolie is left handed and it is her left hand which shows her reality today. As far as I could see from photos of her left hand the line line is long and clear. Not that it necessarily means that she will have a long life. The length of life is not related to the length of the life line, although health issues can be seen from the life line. As to her right hand,which will show her inherited tendencies, I could not get a good enough photo of her right hand (which showed the lines) although it is possible she has a long life line here too. Even if it is short it does not mean she will have a short life. Whether on the right hand or the left hand, the length of the life line does not denote length of life. Left hand shows hereditary tendencies nd right is what you are going yo make up in your future life.take the case of Oscar wild.This is applicable for woman also.